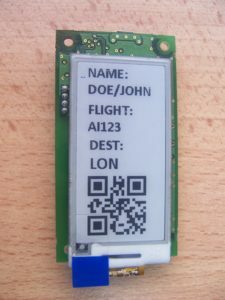 This Wifi connected Electronic Shelf Label (ESL) or Smart Label can display any image or text sent from cloud server on an e-paper display (EPD). It can be made to display QR codes, barcodes, images or any text. The display will retain the content even when power is switched off. It can operate from batteries or from direct wired 5V DC input.